By using this website you agree that the copyright and other intellectual property rights related to the website belong to the NGO Oma Tuba. The content on this website cannot be reproduced or published without consent. Only personal or non-commercial educational use is allowed. However, in case of any reproduction of the content, in whole or in part, it may not be changed and must contain a reference to Feministeerium. We do not allow the reproduction, republishing or otherwise redistribution of the content of this website without written consent and a link or reference to Feministeerium. Any other use of the content, including copying, storing or reproducing, in whole or in part, other than for your own personal or non-commercial educational use, is prohibited without our permission. For other uses or in case of any questions please contact us by writing to omatuba@gmail.com. In this subsection, we will explain which personal data we collect and process as well as which technical and organizational means we utilize and for which purpose and on which grounds to ensure the protection of personal data in our work. Each person has the right to decide how their personal data is used. In our work we collect and process personal data only to the extent that is necessary for achieving our goals. The personal data provided for us is used only for the purpose for which it has been provided. We delete or anonymize data once processing it no longer serves a purpose. We do not sell or rent personal data to anyone. We do not allow access to personal data to the state or anyone else, except in cases where there are clear legal grounds or consent from the data subject and it is in accordance with international human rights norms. We use cooperation partners and service providers which protect personal data. When possible and practical, we use encryption to protect personal data while forwarding as well as storing data. We do not disclose the personal data (including names) of people who have sent us an email or contacted us in any other way to third parties without the permission of the people in question. Emails which have been sent to the general address are reviewed by one staff member in charge of this task, who forwards them to another staff member or other staff members if necessary. Information received via mail is also reviewed by one staff member, sending it to other staff members if necessary. We do not disclose the names of senders to third parties, and we keep the correspondence secure. We collect information given to us by potential and current donors. This may contain contact information, donation amount, history of the donation, and other similar information. For online donations through our website, we use the solution offered by Maksekeskus AS, which processes personal data necessary for the transaction. Donations made through the website feministeerium.ee go to our bank account at SEB bank. We may use data collected from donations (name and email address) to contact you. By entering your email address, you have agreed to receive notifications on the use of the donation or sometimes receiving greetings (for example during Christmas). 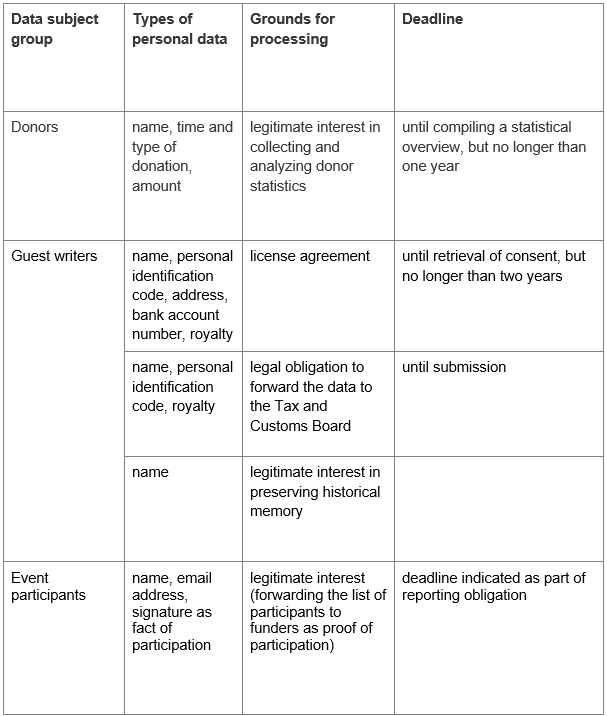 We also store and process personal data connected to donations to fulfil obligations related to accounting and taxes until the obligation expires, as well as for analyzing donor statistics. The processing and storage of personal data necessary for accounting and administration as well as personal data required contractually by our funders for reporting purposes are done following the Estonian laws. The website uses the default HTTPS encryption, which means that the movement of data between our website and the user’s browser is secure. We use different social media service providers to improve our work (Facebook, Twitter, Instagram). We do not export users’ data from our Facebook page. The Feministeerium website has sharing buttons for Facebook and Twitter which enable Facebook and Twitter to know which pages you visit. Please adjust your web browser settings or change your Facebook or Twitter settings to avoid being tracked. We do not forward personal data to third countries without the data subject’s consent or without legal grounds. If a violation related to personal data protection has likely endangered someone’s human rights, we will notify the supervisory authority within 72 hours of discovering it. If the violation has gravely threatened a person’s human rights, we will also immediately notify the person in question. If you wish to use your right to information or your right to see your personal data, if you wish to correct, erase or stop the use of your personal data, please contact us. Every data subject has the right to protect their rights by turning to an independent supervisory institution (Estonian Data Protection Inspectorate) or the court. In case of any questions, please contact us via omatuba@gmail.com. What will happen to the money I donate to the NGO Oma Tuba? All donations will go to the NGO Oma Tuba and will be used for maintaining the Feministeerium website. First and foremost, we use donations to cover costs which are not covered by project funding, but which we deem important to improve our work. We hold ourselves accountable when using the donations. You can donate through the secure and convenient payment system of Maksekeskus or directly through your bank to the bank account of NGO Oma Tuba (EE941010220237419221). How do you report on the use of funds? It is included in the NGO’s annual report. Single donations can be made through Maksekeskus via a bank link (Swedbank, SEB, Danske Bank, LHV, Nordea). You can easily create a standing donation to our bank account at SEB. All transactions are in Euros. If you encounter any problems with any payment method, please contact us. Do I get a tax refund from the donation? Donations made to us are not currently exempt from tax, but starting from July 2019 we will be on the list of non-profit associations and foundations benefiting from income tax incentives. How much of the donations do you use for administrative costs? In case of a single donation, 30 cents from the donated amount will go towards bank transaction fees and 2,5% of the donated amount will go to Maksekeskus. The rest will go directly towards supporting Feministeerium. Please ask your bank about fees applied for standing donations or when donating directly to the NGO Oma Tuba bank account. The bank account of NGO Oma Tuba is EE941010220237419221. Do you publish the names of donators? No, we do not publish the names of donators. We only publish the names of donators if we have clear consent to do so. If it is necessary to disclose large donations (more than 1000€ a year) for transparency purposes, we will first discuss it with the donator and ask for consent.